Above are photos of the ebony bridge I fashioned for the dreadnought. The customer had wanted the shape of the peghead mirrored in the shape of the bridge, so I took a standard Martin bridge and sanded it to its new contours. Then, to "fancy" it up a bit, I inlaid some abalone strips into the ends of the bridge (the customer seemed to like "fancy"). To the right, is the finished guitar, after I have applied the finish, bolted on the neck (gluing only the underside of the fingerboard extension), cut the nut, and glued on the bridge. All that is left to do now is to string it up and adjust the action!!!! 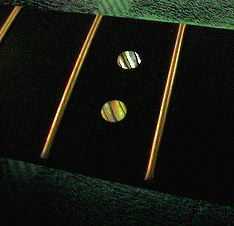 To the left is a close-up of the abalone I used for the fingerboard position dots. Pretty, isn't it? 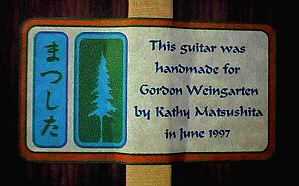 To the right is the label I made on my inkjet printer for Gordon's guitar. The Japanese "hiragana" spells out "Matsushita," which means"bottom of the pine tree."